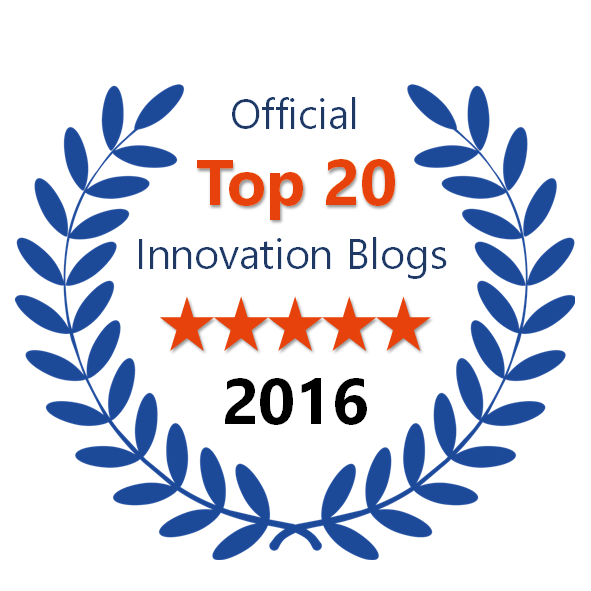 Recently, the Boston Consulting Group (BCG) has published key findings of their latest “Most Innovative Companies 2014” survey. Beside the annual ranking, headed by the top three companies Apple, Google and Samsung, some insightful outcomes with regard to organizational and cultural requirements have striked my eye. According to BCG’s research, successfully innovating companies approach innovation as a system. The system is rooted in experimentation, and, like all adaptive systems, it evolves over time as the external environment and internal needs change. Yet, adaptive cultures are also notable for the behaviors they choose to minimize, O’Reilly notes. There’s less emphasis on being careful, predictable, avoiding conflict, and making your numbers. An adaptive culture, emphasizing experimentation, promotes “organizational ambidexterity“. While startups and small ventures make big bets, i.e. placing all chips on one number, established companies have to avoid losing what they have already built up. However, they have the resources to conduct experiments in order to explore new fields of businesses, concurrently with exploiting their existing business. IBM with their Emerging Business Opportunity (EBO) intitiave can be seen as a prime exaple for this approach. In 2000, they decided to include exploration experiments in their portfolio. Like actual startups, some of these initiatives failed. But there were enough of them (seven in the beginning) that in the first five years alone, the EBOs added $15.2 billion to IBM’s top line, or more than twice as much as acquisitions did. Lesson learned: a balanced portfolio of exploration and exploitation activities is essential for companies in order to thrive on the short and long term. In a more up-to-date sense, this balance also comprises collaborating with external partners, e.g. teaming up between multinational corporations and startups or small companies. Those companies are aware that adaptability through adjustment to changing conditions requires an ability to both observe problems and then respond to them with multiple solutions. The point is not in knowing the single solution. It’s about having various of different options and solutions to turn to. There is a downside to businesses that focus heavily on standardization, optimization, and driving out variability: such organizations leave themselves vulnerable to underinvesting in experimentation and variation. Good experimentation helps firms better manage myriad sources of uncertainty when past experience can be limiting. And it is only through such experimentation, which might include structured cause-and-effect tests as well as trial-and-error experiments, that companies can unlock their true capacity for innovation. The right amount of experimentation depends not only on a company’s resources, but also on the pace of change in its industry. If the industry isn’t changing rapidly, doing a lot of experiments may be unproductive and expensive. But if no experiments are carried out at all, the company is likely to be in trouble if the industry is changing. Given the proven relation between adpative culture and organizational survival and performance, why are so many companies struggling with establishing a culture of exploration, experimentation and variability? Two major stumbling blocks come to my mind. Companies that live only on the left side won’t pay off in the end. Companies that live only on the right side are doomed to die. Startups and small companies often tend to stick to the left side. Large organizations – whether corporations or governments – can easily get stuck on the right side. Successful companies must exist in both worlds simultaneously. That’s hard to do – in particular for the people being supposed to succeed in both “worlds”. Most people seek consistency in order to align their behavior and decisions accordingly. Ususally, corporate cultures are dominated by the right side, thus leading people to incline to conform with the corresponding values. According to Bob Sutton and Huggy Rao, for scaling and established organizations in order to operate smoothly and to develop a collective mindset, it’s crucial that people don’t get conflicting messages. 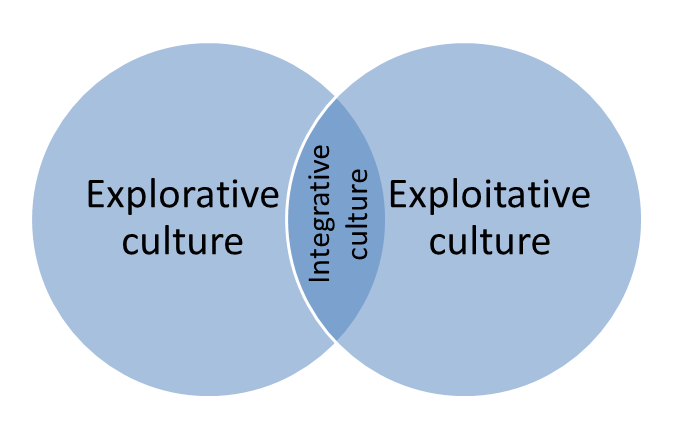 To me, this seems to be a major root cause why putting an explorative culture on top of an (existing) exploitative one – resulting in an “integrative culture” – is extremely difficult. For example, introducing a “x percent rule”, permitting workers to dedicate a portion of time to exlorative projects beside their “core business”, may be sufficient to generate ideas and develop them up to a certain stage. But in most cases this setup does not lead to well-aligned and time-efficient incubation, let alone scaling, within the organization. Succeeding in these phases is strongly tied to full-time resources and a supportive environment. Sure, there are some companies, such as W.L. Gore, proving that this kind of organizational culture can be possible, but these are obviously rare exceptions. It’s a bit like mixing a symphony orchestra with a jazz band and expecting an outstanding concert to happen. With that said, it may be indicated to shape distinct cultures with dedicated values, requirements and people. Each side must operate as if the future of the company depended on it alone! The cultures need to be separated, but with some overlapping “touchpoints” where capabilities, ideas and knowledge are exchanged in order to avoid isolation and to benefit from each other. Examples for touchpoints can be idea management platforms, portfolio management boards, corporate strategy teams or company-wide events and communication platforms. These touchpoints are to be staffed with well-suited people, being capable of integrating both world views and dynamically setting the right priorities. How exploration and exploitation can further be integrated through so-called “integration mechanisms” has been outlined earlier. Case in point: many energy providers and electric utilities are currently undergoing this organizational and cultural tension. While they have been operating on the basis of an entrenched, monopolistic and highly predictable business model and “production-centered mindset” for decades, they are now being forced to transform towards customer-oriented energy service providers. This requires searching for novel, customer-centered business models and tapping emerging markets through experimentation, iteration and openness. This need for innovation is driven by values and capabilities being opposed to what made the companies successful. If not organized and lead properly, such transformation processes are therefore in danger to be accompanied by disorientation, demotivation and frictional losses. Most people are uncertainty- and variance-averse, rather than risk-averse. In business environments, people like and often need predictable outcomes. The difference between risk and uncertainty is well explained by Andrew Hargadon: The big difference between risk and uncertainty lies in their effect on our behavior. We can deal with risk proper. We can’t deal with uncertainty. We calculate the risks that can be calculated, make sure we can afford the losses (or offset them by hedging) and then proceed. In the face of uncertainty, however, we more often choose inaction. How can mandatory experimentation and variance be fostered in face of these common human traits? In fact, we face another paradox here: although an explorative culture is the means of choice to tackle uncertainty on a macro-level, it is often refused since it increases uncertainty on a micro-level. Reiterating the argument above: it seems reasonable to set up dedicated, protected spaces for experimentation, variance and diversity, resourced by people being equipped with the required personal traits. This highlights the importance of proper recruitment for innovation success and sustainable organizational performance. The made suggestions are supported by BCG’s study outcomes. Breakthrough innovators (i.e. strong and disruptive innovators) – accounting for only 7.6% of BCG’s sample, by the way – seem to be especially effective at bringing together required management, governance and organizational design and synthesizing them for high impact. Management. Top management is commited to radical innovation efforts. It backs its commitment with the willingness to green-light radical-innovation projects based on nonspecific or nonfinancial expectations of success rather than projected future returns. Management uses KPIs for radical and incremental projects. It links incentives, recognition, and appraisals to an individual’s contribution to radical innovations. 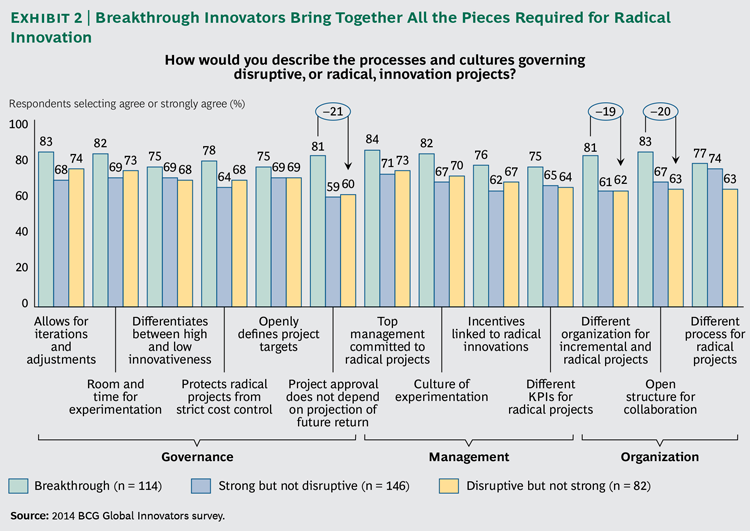 Three-quarters of breakthrough innovators link incentives to radical innovations. Governance. Breakthrough innovators differentiate clearly among projects with low and high degrees of innovativeness and use different processes for radical and incremental R&D projects. Radical projects initially are permitted to have more openly defined project targets. Radical innovation processes allow for iterations and adjustments of initial plans to give individuals and teams ample room and time for experimentation. 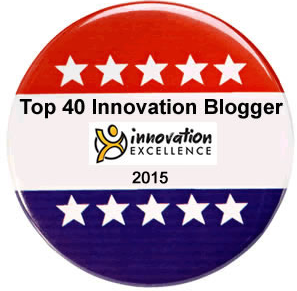 Breakthrough innovators protect radical innovation projects from strict cost-control regimes. More than 80 percent of breakthrough innovators allow projects to start with no projection of future returns. Organization. Three-quarters of breakthrough companies use different processes and KPIs for radical innovation projects. They maintain open organization structures for radical-innovation entities that easily allow for collaboration with internal and external partners. 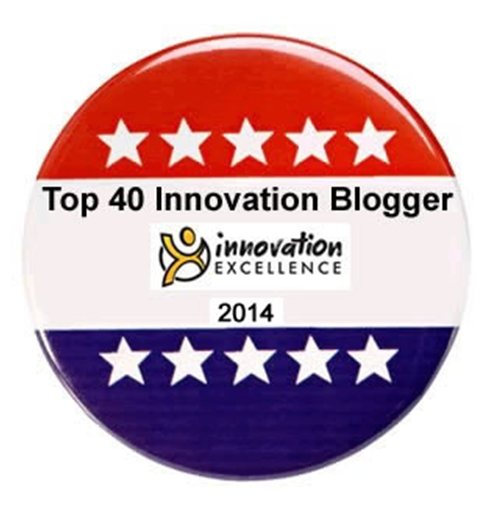 They promote a culture of experimentation and testing that characterizes the radical innovation team. In our experience, a dedicated environment is required to promote this kind of approach. And indeed, across all companies and industries, there is a growing trend toward a centralized approach to innovation and product development – meaning that these functions and processes are either controlled and driven by a centralized organization, or a centralized organization conducts R&D and passes the framework for new products and services to business units or regional units for development and launch. This trend is even more pronounced among strong innovators, with those pursuing a centralized approach rising from 68 percent in 2013 to 71 percent in 2014. Similarly, about 70 percent of disruptive innovators also lean toward a more centralized approach. Two-thirds of all breakthrough innovators stated that all innovation and product development is controlled and driven by a centralized organization, at least in its initial stages. More than 70 percent have a different organizational entity for managing radical innovation. Some breakthrough innovators manage to use the entire company as a new-idea laboratory. Apple under the late Steve Jobs is perhaps the best-known example. Google’s policy of encouraging employees to spend 20 percent of their time working on their own ideas is another. The 3M Company sets the goal of earning 30 percent of its revenues from products introduced in the past five years, and the company aligns its culture and incentives accordingly. It has long allowed its employees to spend up to 15 percent of their time on projects of their choosing. But such companies are for more the exception than the rule. Set up separate organizations for exploitation and exploration beyond a critical company size. Exploration can be driven through internal ventures or external collaboration. Each organization must operate as if the future success of the company depended on it alone. Therefore: don’t establish one culture. Build dedicated cultures in both organizations. Define appropriate values and KPIs for both purposes. Focus particularly on intangible “people issues”, such as mindsets, behaviors and interactions – the soft stuff is the hard stuff! Incentivize, reward and punish behaviors and accomplishments accordingly. Note: culture is continuously shaped, not mandated. Hire the right people to support in the right place. Both accountants and entrepreneurs have a place in the organization, but employed in the wrong context they may even harm. One size doesn’t fit all – for people too! Make sure that “cultural touchpoints” are staffed with integrative thinkers. First and foremost: the CEO. Excellent article, Ralph. The teachings of evolution and natural selection also underline the importance of adaptability to survival, and it seems to be the same in business. If companies continue to excel in areas of declining relevance without opening up new opportunities for the future, they will become vulnerable to their own decline and disappearance. Thanks Kevin – I fully agree with you! Good to hear it’s useful for you, Michel! Adaptability- here lies the issue within innovation adoption. Companies dislike the notion of being adaptable, it flies against their quest for efficencies and effectivenesss, or they think it does. Having a more fluid adaptive approach without a radical redesign and abandonment of 20th Centure notions of organizating work is hard. It will be the 21st century start ups that lay in the foundations of adaptability, the older ones are far too rigid, fixed and determined to keep to the teachings from the business schools. All you can see, is this continuing to unwind, to expose increasingly. Can we at least arrive in operating in this two mind sets of “exploration and exploitation”- what a step that would be in itself. Lets keep believing we are moving towards this shift we do need for innovation to be more entral to the core and more understood in what is its’ make up. Great thoughts on innovation in organizations. It has been noted by researchers that most top executives spend only about three percent of their time thinking about the critical issues that will shape their businesses ten or more years down the road! With the detrimental effect this can have on the life of an organization it is funny to me how overlooked innovation really is. As you stated, the unpredictability can be an issue along with the fear of the unknown. My experience is the tendency to “leave well enough alone”, which doesn’t bode well for an industry as new “up and comers” with advanced technologies and cultures arrive. Finding that sweet spot between the right and left side culture is a balance that can be difficult and will no doubt require the patienece and resources of trial and error. I liked your statement “Each side must operate as if the future of the company depended on it alone!” In society instant gratification seems to be such a focus that the future suffers immensely. Hiring the right people is vital in increasing a companies’ adaptability as well, keeping the integrative thinkers in the positions that can create that needed change. Often finding the right organizational structures, and strategic thinking models can create all the difference in these struggles, yet companies have quite a battle to find the right mold. Businesses struggle on a daily basis with these ideas, and while I do see many changes in the way companies operate, I hope to see continuous positive culture changes into the future. Thank you for your thoughts and a great read! Thanks for your great comment, Brittany! Indeed, I think some degree of separation is the way to go here. Far too many organizations are struggling with building up cultures that try to combine contradictory requirements. But let’s see how this issue will progess. Anyway, as you mentioned, we’ll hopefully see continuous positive culture changes in the future!